All the stars aligned for the Twinkle Gala, creating a magical and flawless evening that unfolded Thursday in the the Rockcliffe Park backyard party paradise belonging to Ottawa tech pioneer Michael Potter. The $5,000-a-plate gala, presented by the charitable Lift Foundation, began with more than 200 ticket-purchasers and their grateful guests strolling through a pretend portal of time to reach the Alice in Wonderland-inspired event. There, attendees discovered through the course of the whimsical evening just how deep the rabbit hole goes. Proceeds from the evening will go toward a $5-million fundraising campaign to provide the best possible care for premature and critically ill newborns at The Ottawa Hospital's neonatal intensive care unit (NICU) at the General campus. Organizers were hopeful that the Twinkle Gala would bring them very close to reaching the campaign goal. The only negative to the night was the realization that there were guests in the crowd that had gone through the agonizing experience of losing a baby. Mark Shabinsky, president of Glenview, took up the cause after his grandson, Joseph, died at age five weeks, on Jan. 10, 2016, at the NICU's General campus. Shabinsky was able to quietly collect large donations for the NICU in the months leading up to the Twinkle Twinkle Future Stars Gala, the largest third-party fundraising event ever held for The Ottawa Hospital. The campaign, thanks to the fundraising efforts of the prominent and well-liked Shabinsky clan and to the family's own generous donation to the cause, had passed the $3-million mark prior to the Twinkle Gala. “He took a bad situation and rather than letting my grandson die in vain he’s making a difference, so that hopefully what happened to my grandson will never happen again,” wife Lynn Shabinsky told OBJ.social. The Shabinsky family is not alone. “When you go out and start talking with people about making donations, everybody has a story. Our story is sad, but everyone has a story,” she added. If there’s a silver lining in all of this, it’s that Joseph’s twin brother Isaac, who was also a patient of the NICU, turned 18 months old on the evening of the gala. The Ottawa Hospital delivers roughly 6,000 babies a year. Of that number, more than 800 end up in the NICU. The gala presented an all-star roster of Canadian talent with legendary Randy Bachman, proud Newfoundlander Alan Doyle and powerhouse Serena Ryder all rocking the room. The very funny Mark Critch from This Hour has 22 Minutes fame was there to emcee, or, as he put it, fulfill the role of dancing monkey. He introduced gala co-chair and volunteer fundraiser extraordinaire Gary Zed as being so Canadian that his last name is Zed (as opposed to Zee, which is how our American friends would pronounce it). Plans to specifically hold the NICU benefit at Potter’s breathtaking estate all started over a backyard play structure, the room heard. Potter, a father of three daughters, realized it was finally time to get rid of the thing, while Zed saw this as an opportunity to erect in its place some massive party tents with staging and a dining area. 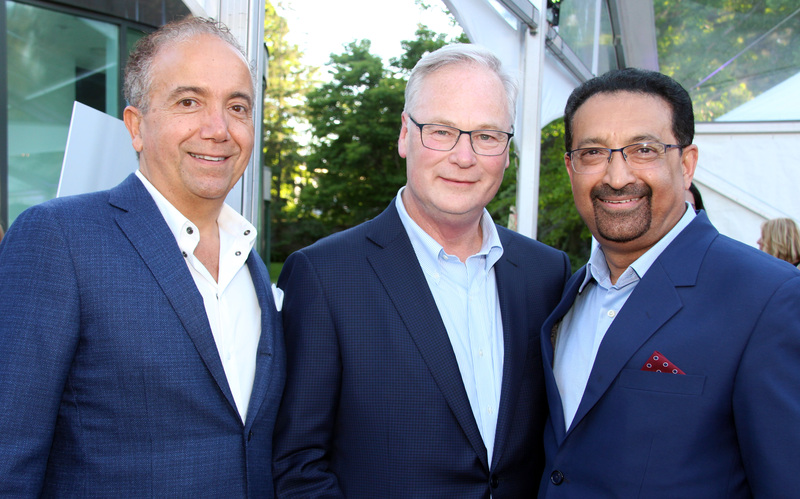 Zed, co-founder of the charitable Lift Foundation, chaired the gala with Dr. Pradeep Merchant, a perinatologist and site chief of neonatology at the Civic campus of The Ottawa Hospital, and Dr. George Tawagi, chief of obstetrics at The Ottawa Hospital. Sponsors in the crowd included everyone from Mike McGahan, president of CLV Group, to Liza Mrak, executive vice president at Mark Motors Audi dealership, to Peter Nicholson, president of WCPD, to real estate lawyer Charles Saikaley, to John Lindgren, an IP consultant with Tessera Technologies, and his wife, Crickett. Potter was honourary co-chair with Roger Greenberg, executive chair of The Minto Group, and John Ruddy, executive chair of Trinity Development. The latter two gentlemen were late arriving to the gala due to the Ottawa RedBlacks' preseason game (they're part-owners of the football team). Invited guests included Dr. Jack Kitts, president and CEO of The Ottawa Hospital, and Tim Kluke, chief executive of its foundation, as well as Shopify COO Harley Finkelstein and some of his colleagues. There were enough obstetrical doctors in the room that the pregnant women were in safe hands, should their water have broken that night. The evening featured food stations and harvest table-style dining beneath delightfully decorated party tents. The gourmet dishes were collaboratively prepared by Chefs Marc Lepine (Atelier), Pat Garland (Absinthe), Justin Faubert (Thyme & Again), Chris Deraiche (Wellington Gastropub), Tim Stock (Play food & wine) and Joe Thottungal (Coconut Lagoon). As well, young actors from 100 Watt Productions performed in character from Alice in Wonderland during the poolside cocktail reception. ZedEvents produced the gala while Event Design handled all the decor and Thyme & Again Creative Catering, led by owner Sheila Whyte, organized the food and drinks.